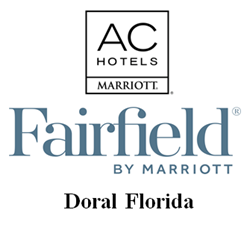 Doral is now home to the AC Hotel and Fairfield Inn & Suites by Marriott Miami Airport West/Doral. AC Hotel Doral is a new, modern, design-driven, lifestyle brand from Marriott International, Inc. The new generation of Fairfield Inn & Suites arrives in Doral designed with oversized rooms, and features that will excel the hotel experience. Both properties are located at 8091 NW 36th Street Doral, near CityPlace Doral. The grand opening celebration was held last Friday April 12 in Doral, Florida. Designed with well-traveled entrepreneurial spirits, the design-led AC Hotel by Marriott introduces an experiential lifestyle brand that has a particular appeal to the millennial mindset, editing away the superfluous in order to create moments of pause for traveling guests. “AC Hotels is transforming the way we hotel. From the high-design of our guest rooms to our focal point AC Lounge, we have attentively designed the property with an attention to detail and a modern mindset,” said, Debbie Meiler, General Manager of AC Hotel Miami Airport West/Doral, which is owned and managed by Baywood Hotels. AC Hotel features unique and spacious guest rooms and public spaces with sleek furnishings and intuitive technology features. A central feature of the property will be its exquisite AC Lounge highlighted by a full bar featuring a mixologist bartender. When combined with the hotel’s 1,040 square feet of flexible meeting space, AC Lounge and additional luxury amenities, the AC Hotel Miami Airport West/Doral modern chic rooms and exceptional personalized service will make the hotel a premier location for business meetings, weddings, weekend gateway and much more. At the AC Hotel Miami Airport West/Doral guests will be able to enjoy European-style tapas as well as unique craft drinks, like the Potion 305, found exclusively at the AC Lounge. The lounge is the perfect hub for guests and locals. Expert mixologists create innovative signature cocktails with local roots. The AC Hotel brand focuses on the beautiful essentials, while also pay homage to the diversity of South Florida. The property includes free shuttle transportation to and from Miami International Airport and complimentary Wi-Fi. The 133-Room Fairfield Inn & Suites in Doral provides a new way to hotel. The property features complimentary amenities such as free shuttle transportation to and from Miami International Airport, hot buffet breakfast, Internet, parking, fitness center, business center and an outdoor pool. Whether traveling for business or pleasure, the Fairfield Inn & Suites Miami Airport West/Doral offers guests new guestroom design, unique and addresses the functional needs of the patrons. The hotel guestrooms were designed with the modern traveler’s needs to stay productive on the road in mind without overcomplicating the guestroom. For more information about AC Hotel and Fairfield Inn & Suites Miami Airport West/Doral click on the link. Fairfield Inn & Suites by Marriott is designed for today’s traveler who is looking to be productive on the road, whether for business or leisure. In addition to complimentary Wi-Fi and hot breakfast, Fairfield Inn & Suites offers thoughtfully designed rooms and suites that provide separate living, working and sleeping areas. With over 900 properties around the globe, Fairfield Inn & Suites is proud to participate in the company’s award-winning loyalty programs – Marriott Rewards®, The Ritz-Carlton Rewards®, and Starwood Preferred Guest® (SPG). The programs, operating under one set of unparalleled benefits, enable members to earn points toward free hotel stays, achieve Elite status faster than ever, and seamlessly book or redeem points for stays throughout our loyalty portfolio of 29 brands and more than 6,700 participating hotels in 129 countries & territories. To enroll for free or for more information about the programs, visit members.marriott.com. For more information or reservations, visit https://www.fairfield.marriott.com/, become a fan on Facebook or follow @FairfieldHotels on http://www.twitter.com/fairfieldhotels. Established in 1975, Baywood Hotels, Inc. is a fast-growing hospitality management and development company, operating $1 billion in assets and employing over 3,000 associates nationwide. The company is headquartered in Columbia, MD and has regional offices in Denver, CO; Miami, FL; Rochester, NY, San Antonio, TX and Northern VA. In each of its regions, the private hotel ownership company is consistently recognized as an innovative leader in the hotel industry, focusing on product concept and development and the outstanding management of its assets. The focused vision, strong values and aggressive long-range strategy of Baywood Hotels has helped the company develop reputable and well-branded hotels in areas where Baywood has competitive expertise and partnerships. Baywood Hotels’ portfolio includes well-known brands, such as Marriott, Hilton and InterContinental Hotels Group, as well as several independent brands. Contact us through Facebook or our website or connect with us on - LinkedIn.